As a famous sports personality once said, "It was DéjÃ vu all over again." Or at least that's how it felt as Duncan Price gave me the tour of his goose hunting grounds. Had not the small, fence-rowed, tree-lined five- to 40-acre fields on the 200-acre dairy farm he hunts been surrounded by the fast-coloring, great northwoods of Michigan's Upper Peninsula; they could easily have been mistaken for any number of those we'd hunted back in the '60s along the east side of the Horicon Marsh. The author and a fat Yooper Canada. And just like so many of those that butted up against Wisconsin's great goose magnet back then; several of Duncan's fields sported simple, permanent, box-type blinds surrounded by semi-permanent, unattended decoy sets deployed by some of his cronies. Far from the mobile and stealthy low-profile layout blind tactics almost exclusively employed wherever the big, dark geese fly these days; Duncan's appeared every bit the throw back-type setup. It remained to be seen how well it would work. "Looks like all we need is the geese," I not-so-brilliantly offered upon completion of our brief tour. "Not to worry. We've got those too," my enthusiastic host promptly replied. Later that afternoon we watched as geese in small flocks came from nearby Portage Lake, and the slightly more distant Keweenaw Bay to which it's attached, only to settle in the roadside pasture next to the cow yard like they'd done it dozens of times before. Which they no doubt had. Without commenting on that fact, it seemed to me that the only 100 or so geese total we'd seen were well-trained locals, and not the migrants I expected to hunt. But they were enough to put a confident smile on Duncan's face, and that's all that seemed to matter. Taking in the sunset back at Duncan's place, a hilltop homesite overlooking Portage Bay; we were treated first to the hollow, distant music, then the ever closer echoing vocalizations of a good-sized flight of migrant honkers. Only as they made their free-of-the-clouds, approach-to-landing glide on the becalmed waters below, did we finally catch a glimpse of them. It was a good omen to be sure. After setting a fair-sized rig of silhouettes to his artist eye's perfection, we settled into our blinds that first morning, Duncan and his burly yellow Lab, Rascal, in one, and Tanner, my always-thinks-he's-the-big dog Lab, and I, in another barely twenty yards to their right. Not trusting they'd play nice, we decided it best to separate the boys. The morning only grudgingly dawned calm, gray, clammy, and birdless. After what seemed like an hour, but was really no more than twenty minutes at best, the resonant honking of geese finally broke the thick-aired silence. Winging in low over the spruce-studded forest from the south, the flock locked their wings and slid confidently into the pasture they'd fed in the afternoon before without so much as giving us a look. It was a sad but predictable pattern repeated by several quick-following, equally well-educated family-sized flocks. Just when it looked like our hunt had gone in the dumper, the growing sounds of unseen geese closing the distance from the north got our attention. Only moments later, after bursting low over the treeline edging our 40-acre hay field like a flight of B-52s trying to fly under the radar, the band of 14 or 15 geese was on us, flaps down, and save for some soft moans, suddenly silent, swinging into our rig like it was old home week. We shot like a pair of goose-fevered rookies, claiming only a bird apiece. But it didn't matter. The dogs had no sooner returned, each happy with their respective prizes, than a repeat performance from another, but double-sized flock of fresh, ready-to-work birds began to unfold. After only one, this time well-composed shot each, our hunt was over. "So&apos;¦ how was that?" Duncan beamed, verbally patting himself on the back. "Just like you said it would be!" I gladly admitted, giving credit where credit is due. While I wanted to hang around just to watch&apos;¦ to see what more the morning would bring&apos;¦ my partner insisted we pull the pin and leave the field to the geese, knowing we might want to hunt it again. It would prove the right call. Though it was difficult to argue the quality of that first morning's hunt, it would have been quite easy, especially at first glance, to take it for granted. But like anything worthwhile, I learned Duncan's hunting didn't come without a ton of effort. Effort born of substantial opportunity. Though its fairly pristine northwoods setting is more well-known for deer, upland birds, fishing, and winter sports; the U.P. boasts a population of resident geese pushing six figures. Couple that with the fact that it lies smack dab in the middle of the migrating corridor for hundreds of thousands of Mississippi Valley Population (MVP) geese originating in the Hudson Bay Lowlands&apos;¦ and, well&apos;¦ there's goin' to be some goose huntin' goin' on! While the majority of the migrating geese make Wisconsin their first stop each fall, many pull up to rest, if only briefly, along the shores of Keweenaw Bay and on Portage Lake, just south of Houghton. Only a glaring lack of agricultural fields in which to feed and fuel up, prevents the area from staging the opportunistic geese in greater numbers. Though he lived for years right under the heart of this flyway, Duncan's fascination with the geese came only with time, and even then as the result of some very special circumstances. Ambitious by nature, Duncan is the kind of independent-type that never has trouble staying busy. Growing up in a non-hunting, non-fishing family in Lower Michigan, he decided early on that city life wasn't for him. By age 20 he moved to the U.P. and got involved in the woods industry, first as a sawmill employee, then, within four years, as a self-taught, self-employed sawyer. with 20- to 30-pound trophies common, and a shot at one of his customer's 61-pound state record, a real possibility. It wasn't until his wife unexpectedly brought the critter home one day 12 years ago, that Duncan found himself suddenly owned by the rambunctious, mischievous, yellow pup he appropriately named, Rascal. Only then did those geese that streamed over his house each fall trip Duncan's waterfowling trigger. He had to do something afterall, to get that dog some birds. So it was in a 20-acre field of his own&apos;¦ one that he rents to the neighboring dairyman&apos;¦ that Duncan and Rascal set out to learn about goose hunting. While they had some limited success early on, (enough to further fuel their collective 'fowling fires); Duncan quickly realized that the dairy farm&apos;¦ then being overpressured by several groups of feuding hunters that pretty much ruined it for everyone&apos;¦ offered some unique, quality hunting potential. Potential that could only be realized if properly managed. Duncan figured he was the man for the job. Convincing the farmer of it, he and several buddies formed a loose-knit hunt club of sorts. Operating with the common sense instincts of a schooled wildlife manager, Duncan set the basic rules. They hunt only half days (mornings), and each hunter or his guest is allowed only 10 shells per hunt. When needed to accommodate surges&apos;¦ or move appropriately the lack thereof&apos;¦ in the migration, fields are rested. The idea being to allow birds already wised up by the gunning to linger unmolested; in hopes they'd attract fresh migrants funneling through the area. Managing hunting pressure in this otherwise fragile situation, is absolutely critical. And it's something Duncan's group religiously does from the season opener on. Now, if we've given you the impression that Duncan's gang has this thing pretty well wired&apos;¦ well&apos;¦ that's far from the case. Sure, if the sometimes abundant, locally-produced geese find the fields to their liking, the early season (Sept. 1-10) can produce a few days of slam dunk gunning. Then too, can the early going in the regular season that begins around September 17th, a time coinciding with the peak of the migration through the U.P. 's northern latitudes. But there is a lot more to this hunt than just showing up for those few prime, near-sure-thing days. And as much as anything it begins with the blinds. Now, it's really not fair to refer to Duncan's as simple box blinds. Far from the basic, open topped variety, his are rather compact, roof-topped, and equipped with a fall away front gate that allows the gunners to safely step forward, then pivot as far as 180 degrees, if necessary, to take birds working behind them. Dressed in Fast Grass and comfortably concealing two hunters and a dog, with both side and front dog doors; these blinds closely mimic the type of round bale commonly found in his farmer's hay and corn fields. Though sturdy, the blinds can be easily loaded by two men onto a specially-built trailer to be relocated as needed. As for decoys, it has been a learn-as-you-go process. 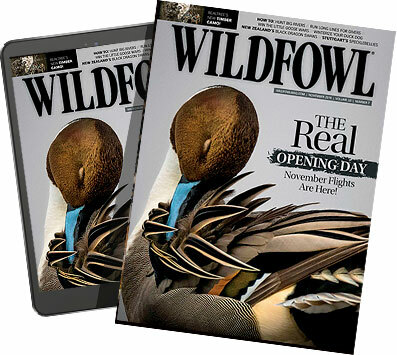 In the early season, when he's dealing with the most birds, Duncan commonly sets six or seven dozen silhouettes in family-sized groups, stringing the wings of the rig downwind of his blind, with the bulk of the spread upwind and behind him. When the flight begins to thin out he downsizes his spread accordingly. In his late season, mid to late October, the few educated birds remaining have become pretty decoy and blind shy. Its then that he'll use the brushy fencelines for concealment and try a small rig set well out into a field upwind of his hide. The shots are longer, but better than none at all. An award-winning master class competition taxidermist by avocation, there's a rig of stuffers in Duncan's future. He just hasn't gotten around to building them yet. Though Duncan's group has darn consistent gunning throughout the heart of the season, there are those days when the geese win. And it looked like it was going to be one of those the last day of our hunt. It was a beautiful September day in Upper Michigan that found us back in our rolling hay field once again. A brilliant sunrise set the countryside aglow, its fall colors at their seasonal peak. And what had begun as a light drift at first light, soon freshened into a gusting breeze from the northwest that rolled thickening bands of cottonpuff clouds across the bluest of blue autumn skies. All was right with our world as Duncan and Rascal, joined by their buddy, Biela Lanczy, piled into one blind; while "T" and I settled into the other. Our barnyard birds showed up right on time, flipping us off once again as they silently and routinely dumped into their pasture. But only moments later a ragged line of excitedly honking, tree top-hugging geese numbering a solid 50 strong, appeared in the east. Wandering and searching, their vocalizations seeming argumentative in nature; these were new birds to be sure. With three of us making noise on our calls, we were able to talk the whole bunch past the real McCoys, and get them started up the hill toward our rig. After two cautious swings a dozen geese broke ranks, determined finally, to come to our party. I watched as they hung and rocked on bowed wings no more than 20 yards over Duncan and Biela, expecting the show's finale at any instant. But it never came. Their blind, as if in a cartoon, seemed to suddenly have a life of its own. I saw the flip gate start to drop, then it snapped back into place. There was some serious jostling going on inside that blind, complete with the sounds of first some indecipherable moaning and groaning, then finally, Duncan's hearty laughter. But the "boys" never did come up to shoot. For those lucky geese it was an inexplicable matter of catch and release. "What the hell?" I questioned aloud for no one but Tanner to hear. I could only shake my head and wonder. Then the real spectacle began. It was a migration day, and a major one at that. For the next two hours there wasn't a moment when we couldn't see, or at least hear strato-high geese riding the upper level gale down from the far north. As I watched yet another flight approach high in the heavens I was startled to see them hit the brakes. Coasting back into the wind they actually began to look us over. Duncan and Biela saw them to, and soon all three of us were playing "here goose, here goose" tunes on our flutes. needed a pit stop. And our setup apparently, looked like a good place to make it. Alternately pumping and locking their wings the flock of 30 or 40 birds began to circle-to-land, slipping altitude with each go round. It probably took a full five heart pounding minutes&apos;¦ maybe even a few more&apos;¦ but there they finally were, well within reach. I kept a close eye on Duncan's blind once again. This time there was no hesitation. When he and Biela came up gunnin' I wasn't far behind. Five geese rolled and smacked the earth, while a sixth, with Biela in hot pursuit, sailed toward the woods edge to our south. After catching up with him I gave Tanner a line on the goose that had crashed somewhere out of sight. While we let the dog do his job I took the opportunity to question Biela about the early morning episode. "Oh, that damn Duncan! He does that to me all the time. Just when I'm ready to let 'em have it he hollers 'No&apos;¦ wait!' for no good reason. He's always pullin' somethin' like that," Biela chuckled. When I asked him about it later, Duncan had no defense. "Hey, this is all about having fun isn't it? Huh?" he challenged with his trademark grin before adding, "Look. We might not be the best goose hunters around. But who has more fun? 'Ole Biela, he's always trigger happy. So I like to mess with him a little. Besides, it all worked out anyway didn't it? Even though I'll admit I was sweatin' it for awhile." "It sure did," I replied adding, "Thanks to the fresh birds." "Now you've got it!" Duncan countered. "Sure, we work hard at this deal. Our blinds seem to do the job. And while our decoy rig probably doesn't match up with that of somebody's pro staffer, the fact that its set where the birds want to be, makes it effective. But it's the fresh birds, something over which we have no control, that key our success day in and day out. Without them this wouldn't be near as much fun." Now there's an honest, appreciative sportsman for you! All in all, Duncan and his yooper buddies seem to have a darn good thing going. Not only are they making the most of a great opportunity, but even more remarkably, they're keeping their priorities straight while they're at it.